Now it’s Star Lord, man. Legendary outlaw. This is a great representation of Peter Quill’s space helmet, again wearable and the hair is a real feather in his cap. I had played around with the concept a few years ago, but I was just going to make it opened and since I don’t have Star Lord’s healthy coif, I abandoned it without even considering brick building the hair. Good on him for not giving up! One thing this build does make me realize is there simply aren’t enough structural plates and tiles in pearl gold. I’ve had to substitute for yellow myself more than once and while it does give it a more “comic Book-y” feel, you have to admit being able to do these yellow highlights in their proper gold would be out of this world. 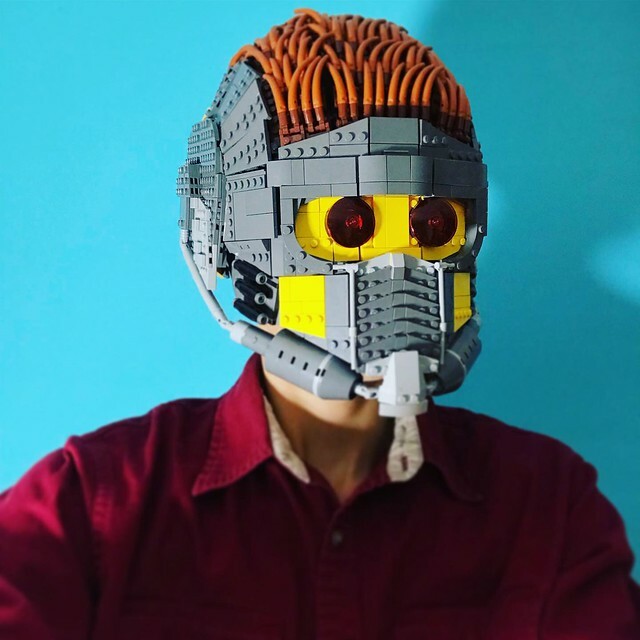 Pop over to Brickatecture’s Flickr page to see more shots of this latest mask that’s been three months in the making. Keep up the good work, B!